Today marks the end of Year of the Snake that runs from February 10, 2013 to January, 30, 2014. 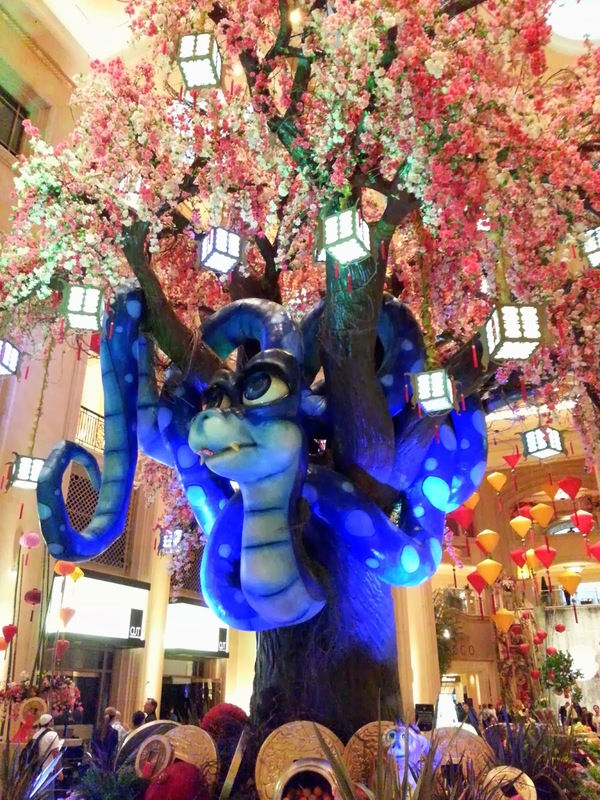 Postcard US-2134679 to China shows the Year of Snake art installation that features Sophie Chow, an animated blue snake twisted around a giant peach tree at the Waterfall and Atrium Gardens of The Palazzo in February 2013. Sophie is 98-feet long, can blink her eyes, sticks her tongue in and out, and move her head side to side. The peach tree that she perches on, at 38-feet tall and 28-feet wide, has 8,800 blossom vines on the tree, adorned with 193,600 flowers and 28 custom dancing lanterns. Golden I Ching coins, representing an abundance of wealth, are placed around the tree.